We provide moving service in Houston, Woodlands, Spring, Cypress, Katy & surrounding areas Houston Moving Company We are Houston Movers that are professional, licensed, insured and affordable. We have rates starting at $150, to move your apartment or home. We are a trusted name in the Houston moving industry and much of our business comes from repeat business from customers who have used us in the past . Our unbeatable offer of 2 movers and a truck for 2 hours for $150 dollars is ideal for anyone moving an apartment or transporting a limited number of items. Customer satisfaction is critical as we rely on repeat business from our customer. Please give us a call for a no obligation moving quote, whether you are needing movers in Houston or movers in Texas. 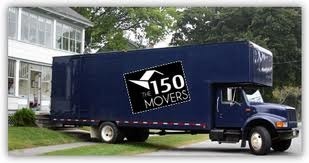 The 150 Movers are licensed in the State of Texas. The 150 Movers use professional movers with years of experience. Each mover on our team is reviewed and tested to make sure they have the experience necessary to be part of The 150 Movers. Two men and a truck is what our typical crew looks like. This optimal team and our moving tools helps to ensure fast, affordable moving and our quality of service is unbeatable by other moving Companies in Houston. The two moving Houston Movers team ensures all of your boxes, furniture, specialty items -- your valued possessions are moved with care. We wrap furniture with shrink wrap & in the trucks with heavy moving blankets and tie them down to ensure that we have a real secure move. Please contact us to set up your upcoming move!